There are plenty of Rodians the background of Star Wars comics - and this is one of them. 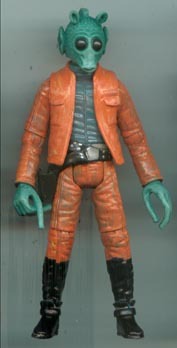 I had a Vintage Greedo with a cloth vest (it wasn't cloth in the movie, so why on the figure?) so I used an extra Biggs jacket. It wound up fitting pretty well. Other than bunching up a bit behind the left shoulder it looks ike it belongs on the figure.